Hospitality is making space for people to be with us and to become within community—to be who they are and to become more like Christ. In Scripture strangers are people who live in a society other than their own. Elsewhere this word is translated “foreigners,” “aliens,” and “sojourners.” Strangers are people who aren’t yet assimilated into our community. Hospitality means making space for strangers. How is God hospitable to you? How has He made space for you and loved you like family? Wise people are hospitable to strangers because they have the physical, emotional, spiritual, and relational space to welcome others into their lives. If we don’t make space for what matters most, we won’t be able to make space for others. Our lives won’t have the bandwidth. Wise people welcome others into their lives as family and with the love of God. In this passage, God commanded His people to treat strangers with hospitality. It’s a cascading command, beginning with not mistreating them, then treating them as if they belong, and finally loving them as ourselves. 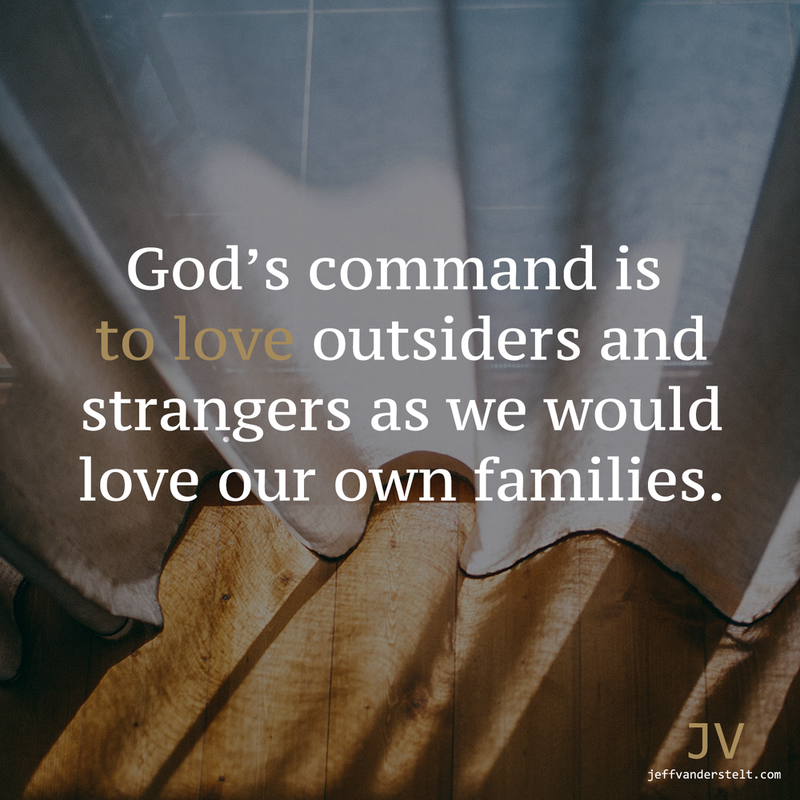 God’s command is to love outsiders and strangers as we would love our own families. Who are the strangers, outsiders, and neighbors around you? How would you characterize your relationships with these people? God loved us when we were strangers, outsiders, even enemies. He loved us as His own children. John tells us that from an unending wellspring of love, the Father has called us to be children of God. Our displays of hospitality aren’t to prove ourselves, show off, or gain approval from others. As children of God, we already have His love. We freely love others with the same welcoming arms with which God has welcomed us. What impact would a biblical view of hospitality have on our city or neighborhood?